FLORA - MURALS - KINDERGARTEN MURALS - NURSERY HABAIT HAKIBUZI - KINDERGARTEN MURALS - TIGER PLAYING ON THE FLUTE. 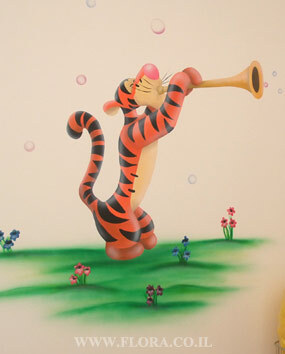 Kindergarten murals - Tiger playing on the flute. Location: Nursery Habait Hakibuzi in Ashkelon. Muralist: Flora.